I was really looking for ways to help me teach students the writing process. This was more geared toward being a writer. And I wish that teacher was in front of me so I could share this essential idea: you can’t teach the writing process. Well, of course you can, there are countless chapters and books and motivational posters and even apps and programs intended to do just that and there are even more professional development sessions to help teachers do just that. But I want to make one thing clear. Just because you teach it, doesn’t mean students will learn it. Teaching the writing process does not make writers. Experiencing the writing process makes writers. That’s why National Writing Project events include so much writing. NWP teachers don’t teach the writing process. We live it. We model it. We write because we are writers and that is what we teach our students to be. 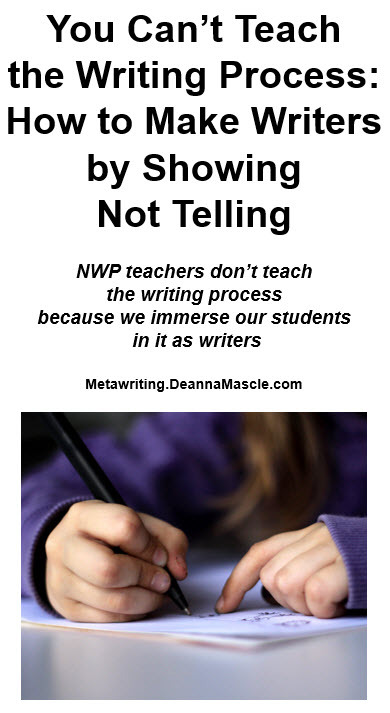 Show don’t tell is one of the most crucial lessons that a writer can learn and this is the essence of the NWP method for creating writers. First we become writers and embrace the writer within all of us. Then we write and write and write. We write on our own. We write with other teachers. We write with our students. We write by ourselves with no company other than our muse. Then we share our writing. We share spontaneous words drafted in the moment. We carefully craft our drafts by sharing and responding to feedback in writing groups. We share our polished writing with the world. We share writing in all these forms with our students as proof that we are writers and they can be too. We do all this by creating a community of writers in our classrooms and pushing our students to write and to share and only then do we lead them forward to shape and polish and publish their writing. NWP teachers don’t teach the writing process because we immerse our students in it as writers. NWP are writers as well as teachers of writers. We don’t teach writing – we teach writers. We love writing and we especially love writing together and that is why WEKY began the day with a poetry slam and ended the day with another writing celebration. In a world where writing is taught by formula we refuse to teach a formula because we know that is not how writers are made. Writers are made in writing marathons, poetry slams, and in classrooms where writing is valued and experienced every day. Writers are made by writing. The students of NWP teachers write a lot. They write often and they write in a variety of forms and for many reasons. They write in short sprints and lengthy marathons. They write creative and pragmatic prose. They write poetry about math and arguments about literature. They use writing to inquire and to investigate and to think. They write. They write because we are helping them become writers and they become writers because our only formula for making writers is to make them write. That is why so many of the sessions at our conference were about writing in a variety of forms and finding inspiration for writing in a variety of ways from games to television to drawing to music. We make writing fun and challenging and exciting so our students protest only when we tell them it is time to put their writing journals away. I am sorry. You are right. There weren’t any sessions about teaching the writing process at WEKY, but that’s because every session was about teaching the writing process and, in fact, the entire conference was about teaching the writing process. Please come back to us and I promise to make our process for creating writers more explicit. Buy this shirt and support this site!